Imagine my delight when one of my favorite illustrators took on my favorite setting- a city! As you turn the gorgeous, oversized pages you'll feel as though you're immersed in the charming city depicted, filled with many of the people, places, and things you'd encounter in the many great cities of the world! From the designer behind Animals comes another eye-catching oversize offering: thirty-two vivid images honoring the sights and staples of our cities. 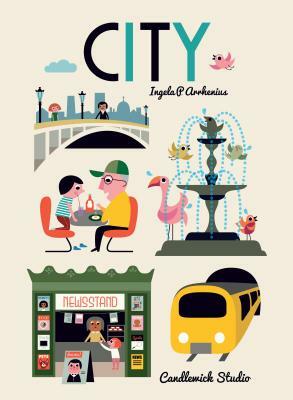 After turning heads and delighting readers with her giant book of animals, Swedish children’s designer Ingela P. Arrhenius turns her talents to the many attractions that make cities so special. Iconic urban images are featured on every page — from subways to skyscrapers, museums to cafes, fountains to sidewalk newsstands. Each bold, graphic image is set apart by a different typeface, transforming a whimsical celebration of cities into an artfully designed title for every bookshelf. Ingela P. Arrhenius is a freelance illustrator and graphic designer who has always loved to draw. She is the illustrator of The World’s Best Noses, Ears, and Eyes by Helen Rundgren and the author-illustrator of Animals, Where’s the Owl?, Where’s the Giraffe?, Where’s the Ladybug?, and Where’s the Hen? Ingela P. Arrhenius lives and works in Sweden. Retro, stylish, and elegant in design, with plenty of detail to engage young kids, this big, bright tome will be a great tool for use in a preschool classroom or library reading circle...Ideal for young listeners and beginning readers who are making their first word associations.